This morning I was doing a run towards gold creek when a TNSW liveried bus went along the Barton Hwy towards Yass. I couldn't get any details of it however it did have a rear desto on it, on the upper left hand side. Anyone shed any light on what it was and why it was here? No idea about a TNSW liveried bus. But i've being seeing an Iveco CB80 Bus operating around Tuggeranong recently. It always says 'Sorry Not in Service' on the front and 'CDC' on the back. Thus leading me to think that it is part of Deanes (CDC). Deanes have been loaned some buses from the fleets of other parts of the CDC group. There are a couple of Hills Bus, a TNSW and a plain white one. Not sure how long they will be down here. Looking forward to driving them. m/o 7588 was sighted operating a Deanes School Service this afternoon. The prospect of more CDC buses here is good news, and I'll be following this up personally! Sounds like I need to visit the twin cities sometime soon. Beats travelling to Sydney! Its hardly good news that they sent down clapped out 25 year old Volvos. It wouldn't be far off being the oldest bus in the yard. What looked like Bus 123 was out on the road today with a trainer at the wheel. 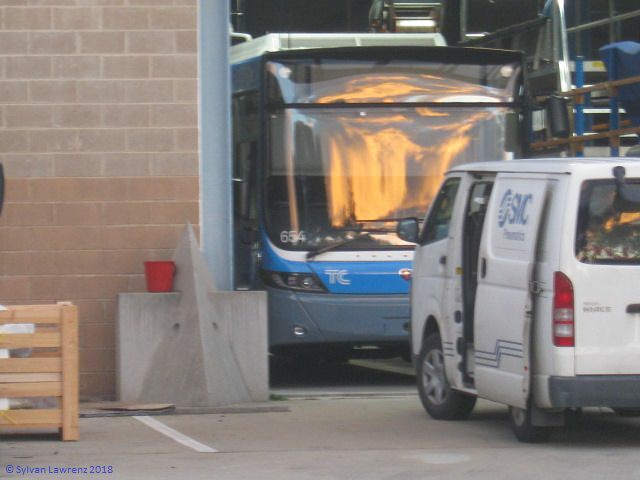 It has been reported on Bus Australia, that 1 or 2 ex-Adelaide Metro O305G's has been sold to someone in Canberra. 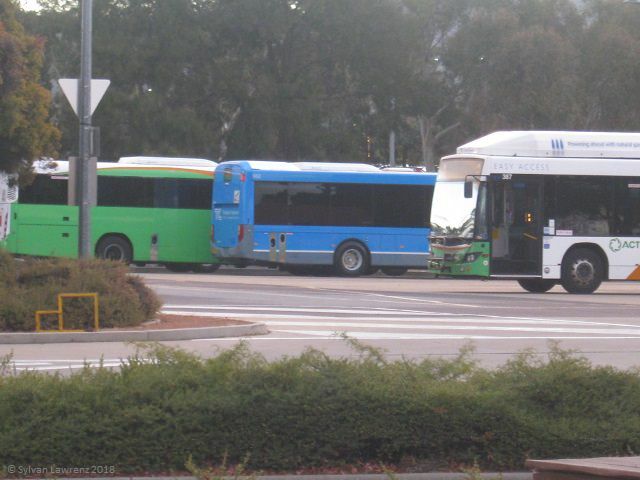 Some sort of squashed up low floor in Q City Transit livery was spotted near Canberra Airport yesterday. Sadly my bags were packed for my trip away so I couldn't take a snap. One of the irisbuses is in Q City livery, could it have been 133 you saw? That was seen driving to a Sydney a few months ago. It didn't look to be like 133. Ex-Adelaide O.305G seen tonight as "Moonlight stretch limo". Is painted purple and has rego MO335. Wonder if it's operated by the same people as the pink Renault PR100.2 (or maybe it's a replacement). Found the Facebook page, the Facebook page for the Pink Party bus is still active. There is a MAN midi with CB30 bodywork over at Queanbeyan now, it was plain white last time I saw it a couple of weeks ago. Could it be that? At Charnwood shops yesterday I saw (I think 865) trying to bring back the past. 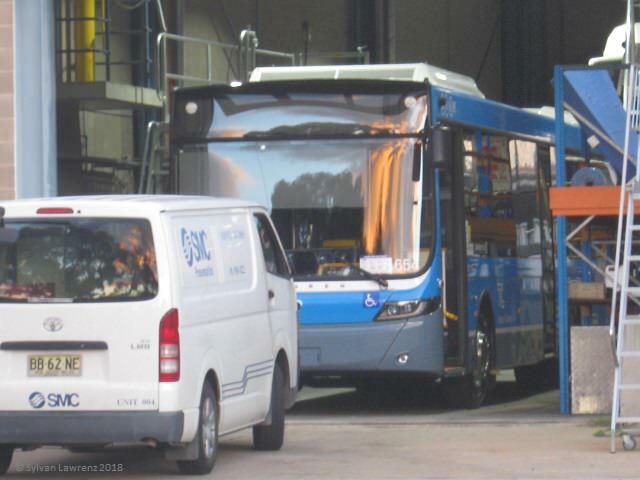 The desto on the bus was set to 450, Belconnen Interchange. No sure what the driver was doing because when I drove past he was standing at the front admiring his handywork! It wasn't by any chance a driver on this board? Spotted what looked to be a Toyota Coaster looking thing with a big maroony red stripe on the front & sides with the Q City logo. I cant be 100% on the logo as it was heading the opposite direction on the Parkway to me & I was approaching the "holy smokes it's a speed camera & I can't possibly drive past the camera at the speed limit so I'll slam on my brakes (without showing my barke lights to the car behind) & go past at 10-15k's under the limit in the right hand lane." So i couldn't pay a great attention to detail. Finally saw 622 today for the first time. Only got a second or two glance at it though as it rushed up Drakeford Drive. Still waiting to see the AVASS buses, cause I didn't notice them in the T depot when I went by on the 9th. 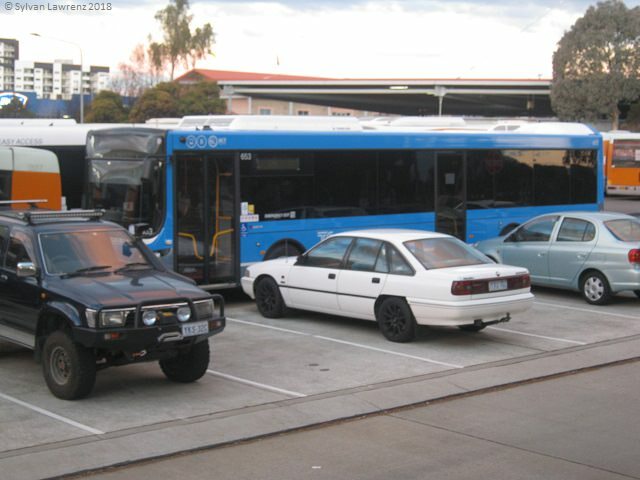 Anyway this topic is for sightings of unusual buses in the ACT. Today I saw a predominantly yellow bus which looked to be a Bustech, with at least the rear bumper grey. I think it had the 40 when flashing stickers. It was turning onto Athllon Dr near Melrose High. Any ideas on what bus it was? Kinda sounds like the recently acquired MAN 12.220 still in CDC Yellow at QCity Transit. Could also be one one of their Transborder liveried Bustechs too I suppose...or whatever else they've got out there now. Should this topic also be used to report interesting or unusual sightings? Yes. This is the topic to report unusual or noteworthy sightings. Spotted a QCity Orana bodied bus back on Thursday in the QCity/DBL livery. They've had them for years? Possibly, but not with fleet number 4554/5445 (one of the other). Looked all flash & new. Saw 622, 634, 636 and 637 all within a short 10 minute space at woden this evening. Surprised to see what I'm pretty sure is the first ever STAG I have seen on Bugden Avenue (between Sternberg and Partridge). It continued on Bugden towards Fadden Hills, not sure what it was operating, if at all. Also saw 921 on training duties on the same portion of Bugden. Bugden Ave is approved for STAGs between Sternberg Cres and Branston St, as the old route 770 was approved. I very much doubt it would have been doing an in service trip however, if it was indeed a STAG, as none of the current routes through there are approved in their entirety, last I checked. The turn off Bugden onto Bramston would be fun in a stag. The artics used to come within a whisker of any car that was waiting to turn right out of Bramston. Was on my way home this evening when I thought I saw a dinosaur bus passing by, which seemed odd at first considering it was a Saturday, turns out it was an ex-action bus. First time I've seen the white and dark green/blue renault in person. I saw the other Marist College bus the other day. Didn't get a good look, so does anyone know what it is? Just saw the ex-newcastle 2619 bus pass by Athllon/Callam Street on Hindmarsh. Haven't seen it in a little while. Finally saw 711 today. Would've like to have ridden it, but it was an out of service run back to the depot after its 65S. I've also seen all up to 660, and none of the newer bustech's. Saw the Devil's bus today, #666 passing through Woden. Wondered how long that would take!